A few months ago I had the complete honour and pleasure to be interviewed by Felicia Lo of SweetGeorgia Yarns for her podcast, The SweetGeorgia Show! We chatted about everything: from knitting and colour to blogging and balance to tendonitis and Carpal Tunnel Syndrome. If you would like to have a listen, Episode 22 is now out! If you do check it out, let me know what you think. Thank you again Felicia for inviting and for having me on the podcast! I'm sorry your pain got that bad! Yikes! I tend to wear craft gloves when I sleep; I feel it helps my blood circulation. I try to stretch now before using the laptop and knitting. I need to do that today. It was fun to hear your voice. 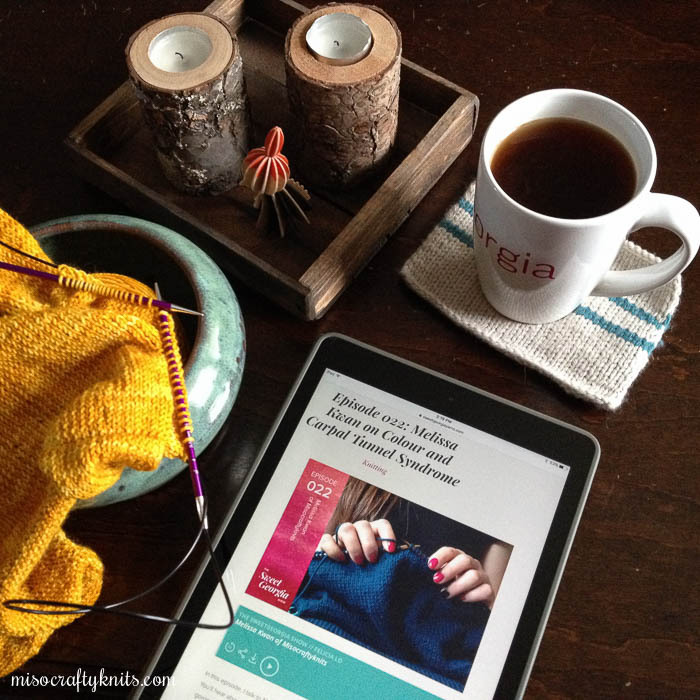 It always feel like an eye opener when I hear a knitter/blogger's voice for the first time. OMGosh! I love color too but pretty much have all neutrals in my drawers and closet. And yes, my knits are the pops of color. I've in the past purged yarn by donating to knitting clubs at the school where my daughters used to attend in San Francisco. It felt really good, especially getting rid of those leftover balls. Longtime lurker, but I thought I'd come out of hiding to tell you how much I enjoyed your podcast with Felicia! (I actually discovered your blog googling pictures of how the Sweetgeorgia colorway "Riptide" worked up.) It was delightful to be able to hear you, as well as enjoying your gorgeous WIPs and FOs over the years. I thought I was developing carpal tunnel earlier this year, but testing showed it was probably just (well, "just") arthritis. I make sure to stretch out my hands really well before and after knitting. I also started using a split keyboard and ergonomic mouse (Microsoft's Sculpt versions) at my day job, which requires a lot of typing, and haven't had any flare-ups since I've been using them. Fingers crossed! Hope your wrists continue to feel better. Hello!! :) I'm a lurker too, so I greatly appreciate you coming out of hiding! I couldn't get used to a split keyboard but I did change my mouse to a trackpad, which has helped a great deal. I'm glad that you were able to find out early (? not saying it's good that you found something "wrong" with your hand, but the lesser of the two evils?) that you had arthritis instead of developing both arthritis and CT, and can find strategies to work around those symptoms. Good luck to you and happy 2016! !